Janet Watson McCONNELL, was born on 4 October 1888 at Carcluie Cottage, Ayrshire, Scotland to John McCONNELL, a gamekeeper and his wife Isabella WATSON. Janet was the fourth child and second daughter born to John and Isabella in a family that would eventually grow to eight children. In the 1891 census she was a 2 year old toddler. Photo left: Janet, summer of 1895 [see post 16 April 2013 for family group photo]. 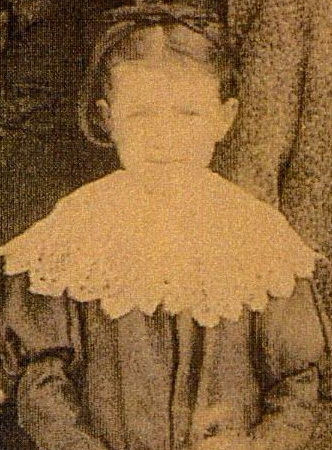 Photo is from the collection of Mary Smith (in Tennessee). May Wood in Ayrshire, Scotland also has a copy of this photograph. By the time of the 1901 census, Janet was a 12 year old ‘scholar’ [attended school]. Between 1902 and 1904 Janet’s life changed dramatically and unexpectedly in several ways. Sometime after the birth of her brother William at Carcluie Cottage in 1902, Janet’s father, for some reason, lost his job as gamekeeper and the family had to move to rented accommodation. Then, on 11 June 1904, her mother Isabella died after an unsuccessful operation at the Western Informary in Glasgow. Although her mother had been sick for some time, her death was not expected. The McConnell family was motherless and Janet’s older sister Mary likely became the surrogate mother. Janet, 15, would have been expected to help with the cooking cleaning and caring for the three younger children: Isabella (13), Elizabeth (9) and, William (2). Her brothers John (19) and Thomas (17) had completed school and worked outside the home; John as an apprentice joiner and Thomas as a clerk. While Janet’s grandmother, Mary Hunter, likely stayed with the family and her aunt Janet (WATSON) and uncle Gilbert SPEIRS helped wherever they could, much would still depend on the McConnell children themselves. In 1905 Janet’s world suffered another blow with the death of her brother Thomas, 18 years old, from tuberculosis. From 1906 to 1912 Janet watched as her immediate and extended family of Watsons, Speirs – and also several of her siblings – moved to Canada, in the USA (in the case of her brother John). But leaving Scotland was not what Janet wished to do. On 7 June 1912, Janet a 23 year old domestic servant, married John THOMSON, a 23 year old locomotive fireman, son of George THOMSON, railway surfaceman and Catherine ROBERTSON. The marriage took place at 169 High Street in Ayr, Ayrshire, Scotland. Janet’s younger sister Elizabeth was one of the two witnesses at the marriage. At the time of her marriage Janet gave her ‘usual address’ as Shona South Park Road in Ayr, likely the address of her employer at the time.